Is Uber Ending its Self Driving Car Program? Ridester has learned that Uber has not renewed its permit to test its autonomous vehicles in California. This is a huge move and shows Uber pulling back in a major way from its plans to launch a self-driving car service. Is this the End of Uber’s Autonomous Cars? Probably not. But it certainly is a game changer. While it all may sound like nothing more than a temporary setback, it’s actually a major blow to Uber’s self-driving program. And it doesn’t bode well for Uber at all. Uber’s whole game plan was based on having a functioning driverless car by the end of the year. They were in a mad rush to get it done and they put safety concerns far down on the list of priorities, according to everyone familiar with the program. The reason this is such a major setback is because, as Travis Kalanick famously agreed, coming in second is to be the first loser. Whichever company hits the road first with fully autonomous vehicles, will win a huge market share among consumers. Whoever comes in second, may as well be third or fourth or fifth. The second place finisher will lose a huge competitive advantage that will cost it millions of dollars – even if they do some day catch up. It was probably unrealistic for Uber to ever think it could beat out Google’s self driving cars (now under the name of “Waymo”). Google began its autonomous vehicle program in 2009 – the same year Uber formed as a company. By the time Uber got around to it in 2015, Google had a six year advantage. Or, to put that another way, Google has been working on these cars for nine years now. Uber has barely put in three years. Google has been working on them more than three times as long. And where Google has been very slow and methodical, showing by their actions that they put safety first – Uber has shown the exact opposite. Uber has rushed things so fast, that the could have only gotten as far as they have by making safety something less than top priority. Waymo recently sued Uber for stealing the secrets to its self-driving technology. Travis Kalanick denied that anything was stolen but Uber still settled – which shows there was enough evidence of guilt that they were afraid of losing in court. Waymo accused Uber of stealing its trade secrets when one of its engineers, Anthony Levandowski, left to start Otto, a self-driving truck company. Uber then purchased Otto for $680 million. In other words, basically this engineer in Google’s self driving program – left and started his own company (after he had already been in talks with Kalanick). Very shortly after he started his company – Uber purchased it for more than half a billion dollars! Kalanick was so ambitious to beat out Google on the self driving cars, that he was willing to do just about anything to do it. He was willing to steal Waymo’s trade secrets. And now it has become apparent, that Uber was willing to put these cars on the road despite the that everyone involved in the program knew they weren’t ready. They weren’t safe enough. The amazing thing is, that Kalanick has been gone from Uber for a good several months now. What happened in Tempe has to come directly under the responsibility of Uber’s new CEO, Dara Khosrowshahi. Khosrowshahi was supposed to be the good guy who was going to right all of Uber’s wrongs. Khosrowshahi was supposed to be the clean corporate citizen who did things the right way. The fact that it was under his leadership that Uber continued to aggressively push its self driving program, even though it was nowhere close to ready, is quite disturbing. There must be something in the water at Uber corporate headquarters. And speaking of Anthony Levandowski, soulmate to Travis Kalanick… when a Tesla driver died in a fatal car crash while using Tesla’s autopilot technology, Levandowski reportedly told several Uber engineers in 2016 that he was “pissed” that Uber didn’t have the first death. In Levandowski’s twisted mind, the first death represented a company that was pushing aggressively ahead. In his very twisted mind, the fact that Uber didn’t cause the first death meant Uber wasn’t pushing aggressively enough. The man Travis Kalanick referred to as his “brother from another mother” because they thought so much alike, actually believed that blood on the road would be a sign of progress for Uber. Evidence is mounting that Uber has cut safety corners in order to save money. This corner cutting was most likely the direct cause of the Tempe woman’s death. Reuters reports that Uber greatly reduced the number of sensors on its latest version of self driving cars. In late 2017, Uber signed a deal with Volvo to purchase up to 24,000 Volvo SUVs between 2019 and 2021 at a total cost of $1.13 billion. It was a Volvo SUV that was involved in the death of the woman in Tempe. Since signing the billion dollar deal with Volvo, Uber apparently decided to save a few bucks on sensors. These are the safety sensors that detect objects in the road. Fewer sensors results in an autonomous car that has more blind spots. The Volvo that killed the female pedestrian in Tempe had more blind spots than the Ford Fusions Uber employed up until 2016. 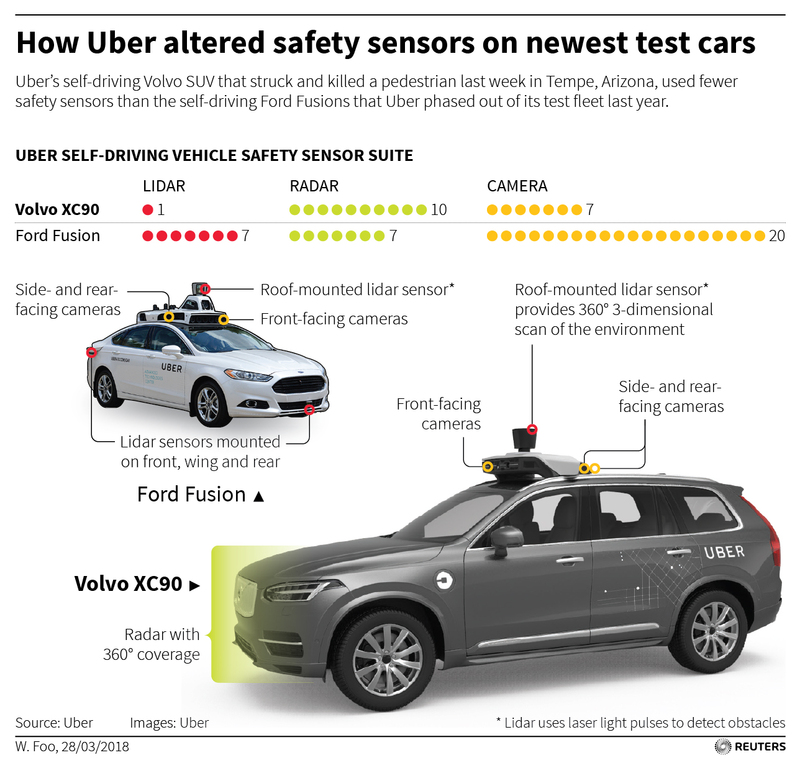 Uber used almost twice as many sensors on the Fusions than they currently use on the newer Volvos. On its earlier self driving cars Uber utilized 34 separate sensors. On its newest cars like the one that hit and killed the woman in Tempe, Uber had just 18 sensors. On the earlier Ford Fusions they used seven LIDAR sensors and on the current models, just one. They had 20 cameras on the earlier models but only seven cameras on the current models. None of that can be outweighed by the fact they now use 3 more the cheaper RADAR sensors than they previously did. With all of this information coming to light, if Uber ends its self-driving program, we can only say, good riddance. If they do not choose to voluntarily end it, they should be forced to by public outcry. If the public really understood how this company operates they wouldn’t want them getting anywhere near self-driving technology. All of this makes us appreciate Google much more and the way they’ve prioritized safety with their self driving cars. They’ve put their cars through millions and millions of miles of tests and nine years later are just now getting ready to put the first ones on the road without human operators. It’s outrageous to think any company could accomplish in three years what has taken Google at least nine – even if they had stolen technology from Google.